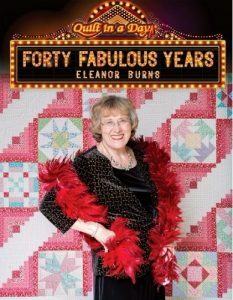 I just got back from Quilt Market where I got to talk briefly with quilting legend Eleanor Burns . She was signing her new book Forty Fabulous Years celebrating her forty years in the quilting business and I was lucky enough to be nearby to get in line. Eleanor is just as full of life as ever and I don’t see her stopping any time soon. I realized later that I should have had my picture taken with Eleanor to share with you, but I’ll just share a copy of the front of her book. It’s a great book. If I’m not mistaken, her first book was a log cabin book, so she decided to write another log cabin themed book. However, she added sampler blocks in between the log cabins, so there are a lot of block patterns included. I was lucky to get a free signed copy, but I would recommend buying it. I’m sure it’s going to be quilting bestseller.